Apparently, analytical solution for these coupled equations is not feasible and we have to use numerical approaches. Model parameters are obtained similar to the single-site model. Additionally, since the adsorption experiments can only provide information on the total concentration of surface sites, we need to know the relative abundance of reactive versus nonreactive sites. That has not been determined unambiguously through experiments, so we simply assume that the reactive sites account for 10% of the total surface sites. Simulations based on the two-site model, as well as parameters used for simulation, are illustrated in Figure 3. In the absence of coadsorbate, concentration v.s. time profiles similar to those from the single-site model can be obtained (Figure 3a), in spite of the fact that a dominant portion of adsorbed TCE is on nonreactive sites, and only a small portion goes to reactive sites. That is because the rate constant k3 is adjusted according to the overall half-life of TCE degradation, and its higher value compensates for the lower adsorbed TCE concentration on the reactive sites. In the presence of a coadsorbate that might preferentially adsorb onto the reactive sites (see Figure 3b), reductive dechlorination could be blocked almost totally, while the total amount of adsorption remains unchanged in comparison to the single-site system. This result can't be derived from a single-site model. To illustrate the applicability of the two-site model, a case study on TCE degradation in the presence of a coadsorbate, cysteine, will be discussed below. SH) functional group. The compound is not expected to be a major component in groundwater, but other reduced sulfide species like HS-may demonstrate similar complexation and redox reactivities. Sulfide is present in many natural anaerobic environments. Microbial sulfate reduction is the main mechanism for sulfide production, which could also be the case in the highly-reducing zone created by iron barriers. A preliminary study has shown that among more than a dozen inorganic and organic chemicals tested for their effects on iron corrosion and TCE reduction, cysteine and adenine demonstrated the strongest inhibitory effect on iron corrosion and TCE reduction (Deng et al., 1998). cysteine up to a concentration of 1.0 mM. The calculated amount of TCE sorbed is approximately 40 fJ.M or 0.53 (amol/m2 of Fe surfaces. The effect of cysteine on TCE degradation was examined in bottles with 35.0 ml aqueous phase and 37.0 ml headspace. The experiments were set up in an anaerobic glovebox (100% N2). The reaction progress was monitored by headspace analysis of TCE and its degradation products on a SRI 8610C GC, which was equipped with a silicon capillary column and a flame ionization detector. 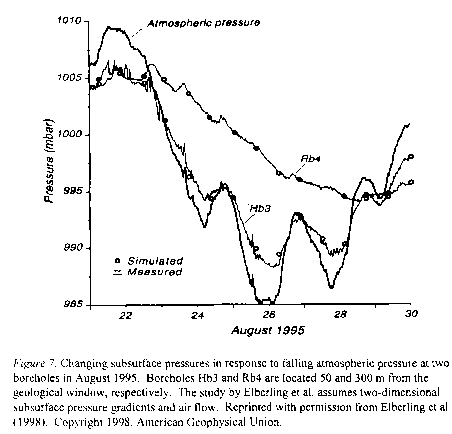 TCE concentration in the aqueous phase ([TCE]aq) was then determined by the Henry's law with KH = 0.392 at 1 atm and 25 °C (Gossett, 1987). 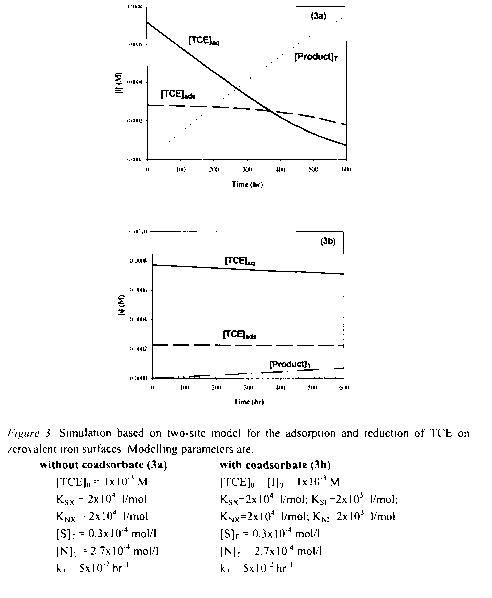 As illustrated by Figure 5, in the control with only aqueous TCE, its concentration is decreased from 328 ||a.M to 230 (J.M in a period of 360 hrs due to TCE leaking from the system. In the presence of ZVI, TCE concentration is decreased, following a pseudo-first order kinetics with a half-life of 85 hrs. 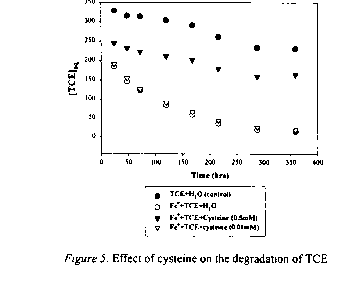 Cysteine, at a concentration of 0.50 mM, dramatically decreased the rate of TCE degradation as indicated by a concentration profile of TCE parallel to the control. Since 0.50 mM cysteine does not significantly affect the TCE sorption behavior but essentially shuts off its reduction, we conclude that there must be at least two types of surface sites, and cysteine can almost totally cover the reactive sites when its concentration is sufficiently high, so no significant TCE degradation takes place. Separate experiments have shown that cysteine adsorption is 0.35 mM when a total of 0.50 mM cysteine is added (Hu, 1999). This suggests that the reactive sites are equal or less than 0.35 mM. 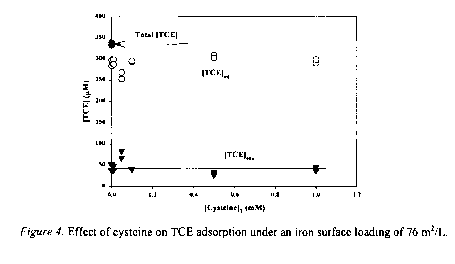 The maximum TCE adsorption is 4.3 mM under the same iron loading (Hu, 1999). Therefore the reaction sites represent only a minor fraction (ca. 8%) of the total sorption sites. On the other hand, in the presence of 0.010 mM cysteine, TCE degradation is not significantly decreased. The amount of cysteine adsorbed is 0.006 mM (or ca. 0.14% of the total surface sites) under these conditions, so the reactive sites must be higher than 0.006 mM. Although reductive dechlorination is modelled either based on an empirical approach or a single site model, TCE dechlorination in the presence of cysteine apparently requires the use of a two-site model. The simulation as shown in Figure 3b indicates that quantitatively, the two-site model proposed here is sufficient for the interpretation of the experimental results. To enhance the predictive capability of the model, further research is needed to determine adsorption parameters independently.